Tracing is evil and wrong and you are evil and wrong for tracing! Tracing is okay for practice, but real artists don’t need to trace. Tracing is an acceptable art form. I’m firmly in the #3 camp with a caveat that I will get to in a minute. For beginners, I think tracing is good practice. When you’re initially studying art, and anatomy in particular, you will waste a lot of time drawing a lot of wrong things if you don’t trace a little to get yourself used to where things go. Part of learning how to draw is learning how to compose a complex illustration from simple strokes on the page. If you start by tracing you will simultaneously enhance your brain’s ability to see the composition in smaller parts, and your hand and arm will get used to the motions so that it feels natural to you. Think of a golfer learning to swing. You can go in there and pick a club and just start swinging… but you can’t really see what you are doing and you will waste a lot of time tiring yourself out swinging incorrectly before you accidentally do it right a few times. Most golfers will watch other people swing and try to emulate that at first. You can even have your swing analyzed by a computer or hire a personal trainer. It will still take a lot of practice to get good at golf, but you cut the initial learning time dramatically by using all the available helper tools that you can. So, now let’s say you are a good artist and don’t need to trace anymore. Why would you do it? Well, now that you know how to draw and you can do it… tracing is still useful. You can do the work much faster by tracing even if you don’t need to do it. Can you draw a straight line without a ruler? Can you draw that same straight line a lot faster, and probably cleaner as well, with a ruler? Would you refuse to use a ruler just to keep purity in your art? I was at the Raleigh Comic-Con last year as a guest, and I was doing small sketches during the show. At one point I was going to draw Captain America’s shield. The artist next to me said, matter-of-factly, that he wouldn’t dare draw a circle freehand and that I was brave to try. I was sketching my circles on a quadrant so I really was only drawing four connected arcs to make my circles. This allowed me to be pretty fast at sketching and create reasonably good circles. Truth be told, though, he was absolutely right. I could have drawn the same circles much faster and cleaner with the right tools. I know how to draw circles and I can draw them with a little patience… but there’s nothing to be gained from refusing to use the right tool for the job. And now comes the caveat. In my opinion there are only two unacceptable practices in tracing. First, I believe you should not try to pass off your work as if you didn’t trace. Own the practice, own your creation! If you traced some photographs to make it better or finish it faster, embrace it and don’t run from it. Second, make sure you are using photographs in the public domain or ones that you take yourself or otherwise have obtained the rights to use in your art. If you embrace it, have permission to do it, and it makes your art better… I say trace all you want. Embrace the trace! 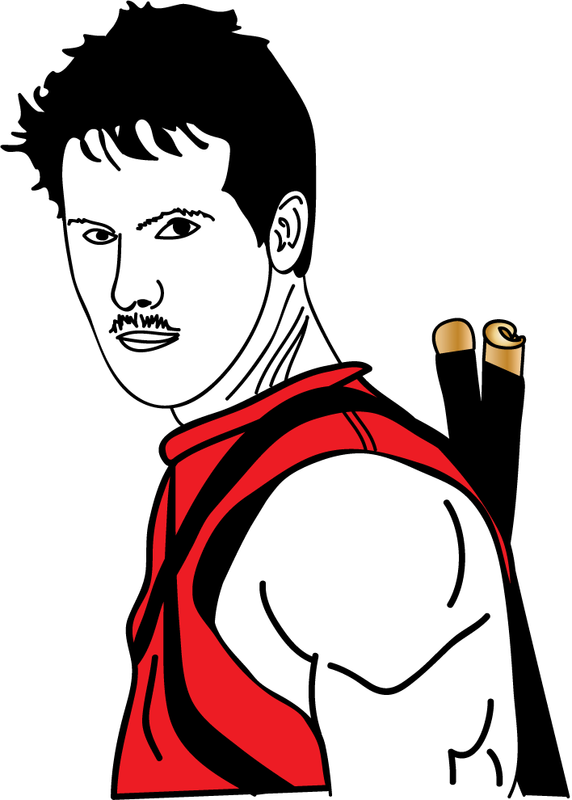 Meanwhile, as part of that discussion thread… people started posting their version of a trace of Ryan Reynolds as Deadpool from a movie still photograph. I didn’t want to feel left out, so I took a stab at tracing the photograph myself and am posting it here on my blog. I colored the clothing and accessories, but stopped there as the purpose of the exercise had been served at that point for me. What was interesting, and perhaps surprising to some in the discussion, every person’s trace of the exact same photograph came out looking differently… which means even when we trace, our personal style is coming through in the final product. Okay, so some of you probably already noticed there was no new Fringe Kisses cartoon yesterday (Saturday). The bad news is that was on purpose. My main strip ‘Sects is taking more time now that I do a Sunday edition and I feel that the quality of the Fringe Kisses comic strip has suffered. Fringe Kisses is going on a hiatus for the time being. That doesn’t mean you will never see another new one again, it just means there will be no regular place for it on the schedule. The good news is it means I can put more time into other new ideas for the blog so keep your eyes open for surprises!